The lunar maria are large, dark, basaltic plains on Earth's Moon, formed by ancient volcanic eruptions. They were dubbed maria, Latin for "seas", by early astronomers who mistook them for actual seas. They are less reflective than the "highlands" as a result of their iron-rich composition, and hence appear dark to the naked eye. The maria cover about 16% of the lunar surface, mostly on the side visible from Earth. The few maria on the far side are much smaller, residing mostly in very large craters. 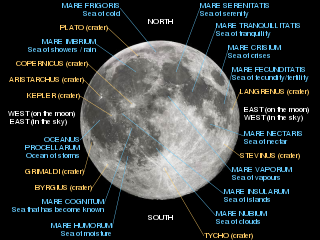 The traditional nomenclature for the Moon also includes one oceanus (ocean), as well as features with the names lacus (lake), palus (marsh), and sinus (bay). The last three are smaller than maria, but have the same nature and characteristics. In astronomy, libration is the wagging of the Moon perceived by Earth-bound observers caused by changes in their perspective. It permits an observer to see slightly different halves of the surface at different times. It is similar in both cause and effect to the changes in the Moon's apparent size due to changes in distance. It is caused by three mechanisms detailed below, two of which are causing a relatively tiny physical libration via tidal forces exerted by the Earth. Such true librations are known as well for other moons with locked rotation. Luna 3, or E-2A No.1 was a Soviet spacecraft launched in 1959 as part of the Luna programme. 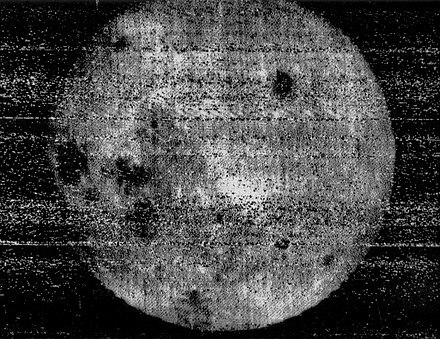 It was the first-ever mission to photograph the far side of the Moon and the third Soviet space probe to be sent to the neighborhood of the Moon. 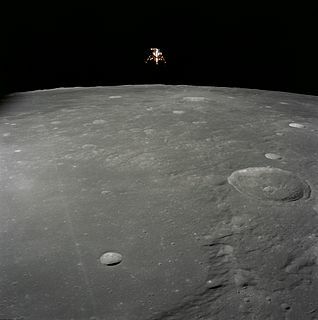 Though it returned rather poor pictures by later standards, the historic, never-before-seen views of the far side of the Moon caused excitement and interest when they were published around the world, and a tentative Atlas of the Far Side of the Moon was created after image processing improved the pictures. Apollo 8, the second manned spaceflight mission flown in the United States Apollo space program, was launched on December 21, 1968, and became the first manned spacecraft to leave low Earth orbit, reach the Moon, orbit it, and return. The three-astronaut crew—Frank Borman, James Lovell, and William Anders—were the first humans to witness and photograph an Earthrise and to escape the gravity of a celestial body. Apollo 8 was the third flight and the first crewed launch of the Saturn V rocket and was the first human spaceflight from the Kennedy Space Center, located adjacent to Cape Canaveral Air Force Station in Florida. Tidal forces from Earth have slowed down the Moon's rotation to the point where the same side is always facing the Earth—a phenomenon called tidal locking. 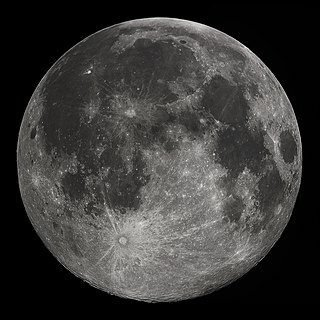 The other face, most of which is never visible from the Earth, is therefore called the "far side of the Moon". Over time, some parts of the far side can be seen due to libration. In total, 59 percent of the Moon's surface is visible from Earth at one time or another. Useful observation of the parts of the far side of the Moon occasionally visible from Earth is difficult because of the low viewing angle from Earth (they cannot be observed "full on"). The tidal force is an apparent force that stretches a body towards and away from the center of mass of another body due to a gradient in gravitational field from the other body; it is responsible for diverse phenomena, including tides, tidal locking, breaking apart of celestial bodies and formation of ring systems within Roche limit, and in extreme cases, spaghettification of objects. It arises because the gravitational field exerted on one body by another is not constant across its parts: the nearest side is attracted more strongly than the farthest side. It is this difference that causes a body to get stretched. Thus, the tidal force is also known as the differential force, as well as a secondary effect of the gravitational field. 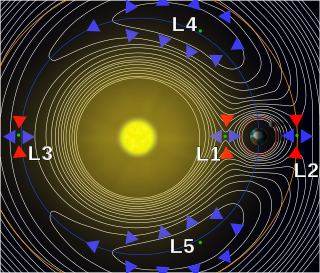 Tidal locking occurs when the long-term interaction between a pair of co-orbiting astronomical bodies drives the rotation rate of at least one of them into the state where there is no more net transfer of angular momentum between this body and its orbit around the second body ; this condition of "no net transfer" must be satisfied over the course of one orbit around the second body. This does not mean that the rotation and spin rates are always perfectly synchronized throughout an orbit, as there can be some back and forth transfer over the course of an orbit. This effect arises from the gravitational gradient between the co-orbiting bodies, acting over a sufficiently long period of time. The full moon is the lunar phase when the Moon appears fully illuminated from Earth's perspective. This occurs when Earth is located between the Sun and the Moon. This means that the lunar hemisphere facing Earth – the near side – is completely sunlit and appears as a circular disk, while the far side is dark. 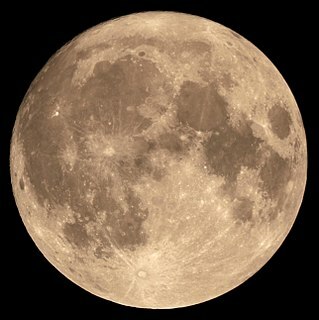 The full moon occurs once roughly every month. The two hemispheres of the Moon have distinctly different appearances, with the near side covered in multiple, large maria (Latin for 'seas,' since the earliest astronomers incorrectly thought that these plains were seas of lunar water). The far side has a battered, densely cratered appearance with few maria. Only 1% of the surface of the far side is covered by maria,   compared to 31.2% on the near side. One commonly accepted explanation for this difference is related to a higher concentration of heat-producing elements on the near-side hemisphere, as has been demonstrated by geochemical maps obtained from the Lunar Prospector gamma-ray spectrometer. While other factors, such as surface elevation and crustal thickness, could also affect where basalts erupt, these do not explain why the far side South Pole–Aitken basin (which contains the lowest elevations of the Moon and possesses a thin crust) was not as volcanically active as Oceanus Procellarum on the near side. Geochemical modeling is the practice of using chemical thermodynamics, chemical kinetics, or both, to analyze the chemical reactions that affect geologic systems, commonly with the aid of a computer. It is used in high-temperature geochemistry to simulate reactions occurring deep in the Earth's interior, in magma, for instance, or to model low-temperature reactions in aqueous solutions near the Earth's surface, the subject of this article. It has also been proposed that the differences between the two hemispheres may have been caused by a collision with a smaller companion moon that also originated from the Theia collision. In this model, the impact led to an accretionary pile rather than a crater, contributing a hemispheric layer of extent and thickness that may be consistent with the dimensions of the far side highlands. Until the late 1950s, little was known about the far side of the Moon. 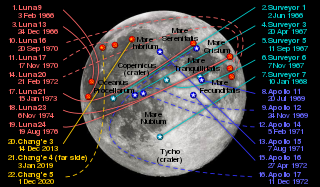 Librations of the Moon periodically allowed limited glimpses of features near the lunar limb on the far side, but only up to 59% of the total surface of the moon. These features, however, were seen from a low angle, hindering useful observation. (It proved difficult to distinguish a crater from a mountain range.) The remaining 82% of the surface on the far side remained unknown, and its properties were subject to much speculation. Sundman is a lunar impact crater that lies just past the western limb of the Moon. Although it lies on the far side from the Earth, this part of the surface is brought into view during periods of favorable libration and illumination. Sundman lies to the southwest of the walled plain Einstein, and to the west of the Vallis Bohr cleft. 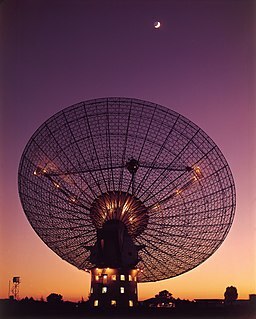 It was named after Finnish mathematician and astronomer Karl F. Sundman. 1 2 Sigurdsson, Steinn (2014-06-09). "The Dark Side of the Moon: a Short History" . Retrieved 2017-09-16. 1 2 O'Conner, Patricia T.; Kellerman, Stewart (2011-09-06). "The Dark Side of the Moon" . Retrieved 2017-09-16. 1 2 Messer, A'ndrea Elyse (2014-06-09). "55-year-old dark side of the moon mystery solved". Penn State News. Retrieved 2017-09-16. 1 2 Falin, Lee (2015-01-05). "What's on the Dark Side of the Moon?" . Retrieved 2017-09-16. ↑ "Chinese spacecraft makes first landing on moon's far side". AP NEWS. 2019-01-03. Retrieved 2019-01-03. ↑ Kenneth Silber. "Down to Earth: The Apollo Moon Missions That Never Were". ↑ "Dark No More: Exploring the Far Side of the Moon". 29 April 2013. ↑ J. J. Gillis; P. D. Spudis (1996). "The Composition and Geologic Setting of Lunar Far Side Maria". Lunar and Planetary Science. 27: 413. Bibcode:1996LPI....27..413G. 1 2 3 4 Ley, Willy (April 1966). "The Re-Designed Solar System". For Your Information. Galaxy Science Fiction. pp. 126–136. ↑ M. Jutzi; E. Asphaug (2011). "Forming the lunar farside highlands by accretion of a companion moon". Nature. 476 (7358): 69–72. Bibcode:2011Natur.476...69J. doi:10.1038/nature10289. PMID 21814278. ↑ Near-side/far-side impact crater counts by David Morrison and Brad Bailey, NASA. http://lunarscience.nasa.gov/?question=3318. Accessed Jan 9th, 2013. ↑ Messer, A'ndrea Elyse (2014-06-09). "55-year-old dark side of the moon mystery solved". Penn State University. Retrieved 2016-06-27. ↑ "How much moon do we see? | EarthSky.org". 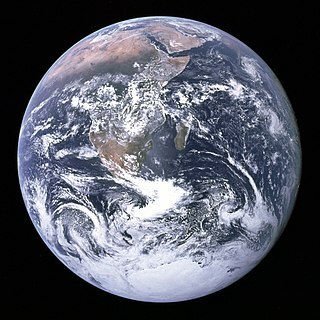 earthsky.org. Retrieved 2019-02-06. ↑ "NASA - NSSDCA - Spacecraft - Details". nssdc.gsfc.nasa.gov. ↑ Launius, Roger D. "Aeronautics and Astronautics Chronology, 1960". www.hq.nasa.gov. ↑ "Sphæra: the Newsletter of the Museum of the History of Science, Oxford". www.mhs.ox.ac.uk. ↑ "Page not found - Adler Planetarium". Adler Planetarium. ↑ "Works of the Department of lunar and planetary research of GAISh MGU". selena.sai.msu.ru. ↑ "Discussion". Space Policy. 14 (1): 5–8. 1998. doi:10.1016/S0265-9646(97)00038-6. ↑ "Chinese spacecraft makes first landing on moon's far side". Times of India. Associated Press. 3 January 2019. Retrieved 3 January 2019. 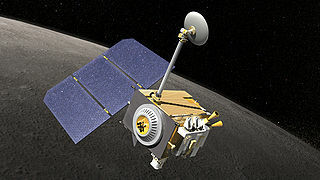 ↑ "China aims to land Chang'e-4 probe on far side of moon". Xinhua English News. 2015-09-08. Archived from the original on 2015-09-10. ↑ Stenger, Richard (2002-01-09). "Astronomers push for observatory on the moon". CNN. Archived from the original on 2007-03-25. Retrieved 2007-01-26. ↑ M. B. Duke; B. C. Clark; T. Gamber; P. G. Lucey; G. Ryder; G. J. Taylor (1999). "Sample Return Mission to the South Pole Aitken Basin" (PDF). Workshop on New Views of the Moon 2: Understanding the Moon Through the Integration of Diverse Datasets: 11. ↑ "Thar's Gold in Tham Lunar Hills". Daily Record. 2006-01-28. Retrieved 2007-01-26. ↑ Schmitt, Harrison (2004-12-07). "Mining the Moon". Popular Mechanics. Archived from the original on 2013-10-07. Retrieved 2013-10-07. ↑ "What's on the Far Side of the Moon?". Paranormal.about.com. 2013-12-19. Retrieved 2014-01-05. ↑ "UFOs on the Moon 1". Ufos.about.com. 1968-12-24. Archived from the original on 2013-10-23. Retrieved 2014-01-05. ↑ "Answered Question « Ask an Astrobiologist « NASA Astrobiology". 9 September 2012. Archived from the original on 9 September 2012. ↑ The Fog of War , Errol Morris, 2003. Retrieved, Oct. 19, 2013. ↑ U.S. had plans to nuke the moon., CNN Nov. 28, 2012. Retrieved, Oct 21, 2013. 1 2 3 4 5 "Chang'e-4's moon landing site named". China Daily. 17 February 2019. Retrieved 16 February 2019. 1 2 3 4 5 "IAU Names Landing Site of Chinese Chang'e-4 Probe on Far Side of the Moon". International Astronomical Union. 15 February 2019.